There are two main bicycle valve types, which are Presta valves and Schrader Valves. Here's a look at the difference between Presta and Schrader valves, and which are best for bike touring. So, you thought that all types of bicycle valve stems were the same? Think again, because there's two different bike valve types out there! There two main bike valve types used on bicycle inner tubes nowadays, are Presta and Schrader Valves. 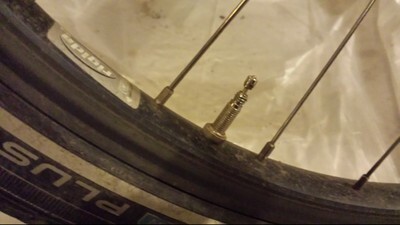 You can go bike touring with either bicycle valve stem types. Most of the time, no choice or thought is involved. 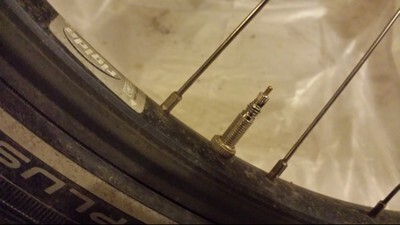 A bicycle will simply come with wheels that are pre-drilled for either Presta or Schrader valves. Anyone considering building their own wheels for bicycle touring, replacing wheels, or working out the specs for a new expedition or touring bike might like to think a little more about bike valves though. Sometimes, choices made regarding the seemingly simplest of things can make life harder or easier when out on the road. This is definitely the case with Presta and Schrader valves. Here, as part of my bicycle touring tips series, I outline the technical and practical aspects of the bicycle valve types, along with the pros and cons of each. As always, I would love to hear about your thoughts and experiences in the comments section below. The Difference between Presta and Schrader Valves? Well, it all comes down to size. Apparently, it does matter after all! 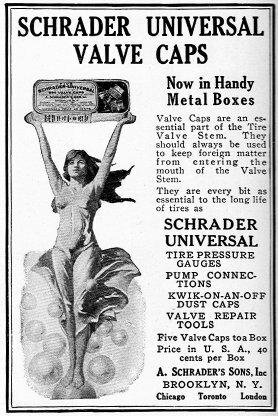 Schrader valves are fatter, and Presta valves are thinner. This means that the hole diameter in the wheels rim will also be different, and although you can use Presta valves in Schrader drilled wheels if you have to, you can't do it the other way around. So, what is the point of having bicycle valve types with two different diameters? It only confuses people when it comes to buying bicycle inner tubes! Is there something else that makes them different? These are most commonly used on racing style road bikes with 700cc wheels. They have also carried over to 26 inch wheels used on mountain bikes and specialised touring bicycles. The most noticeable feature of a Presta valve, is that the top section must be unscrewed before air can be put in or out. Presta valves also come with a locking nut which holds it tight against the rim of the bicycle. It is often commented that the main reason to use this style of valve, is to allow higher pressurised inner tubes, and whilst this is true, there are other attributes. The skinnier Presta valve needs a smaller hole in the wheels rim. This means that the rim strength will be greater than it would be if it had a larger hole for the Schrader valve. As most touring cyclists carry quite a lot of weight on their bikes, this could be quite significant in the long run. Something worth considering. They are available in different valve lengths, which can be quite a bonus if you are running deep rims. As the Presta valve is one way, the inner tube will not lose any pressure when a pump is taken off it. This is one of the reasons that it is used when high pressures are needed. Whilst this is perhaps not significant for the vast majority of bicycle tourers, there is a certain irritation factor. Pumping up a tyre, only to find that it loses a bit of pressure when you remove the pump from the valve is annoying! Presta valves keep their tyre pressure, as once the screw has been tightened down, air will not leak from the valve. You need to be careful when pumping up tyres which have a Presta valve, as the valve itself can be quite fragile, and they can break. Whilst you can find Presta inner tubes in most western countries, they are a real rarity everywhere else. Bicycle tourers heading off into less developed countries should ensure they have adequate spares. They are marginally more expensive. This style of bicycle valve is found on practically every type of car and motorcycle worldwide. It is most used on bicycles where lower tyre pressures are required. Known as the car type valve, it is commonly found on mountain bikes, BMX's and kids bikes. Many touring cyclists roll with this type of valve simply because it was on the bike when they bought it. Schrader valves are considered to be more sturdier and robust. Being the most common bicycle valve type, Schrader inner tubes can be found in virtually any part of the world. It is possible to inflate these tyres at a garage if for some reason a hand pump is lost when bicycle touring. When doing this, it's important to keep an eye on the pressure. Inflating via a pneumatic car pump can be a great way to wreck the inner tube, tyre, and even rim! Having less exposed parts than its Presta counterpart is one of the reasons Schrader valves are considered to be sturdier. This type of valve requires that a larger hole is drilled into the rim. This might reduce a wheel rims overall strength over time, especially on the cheaper ones. Whenever attaching or removing a pump, the inner tube will lose a small amount of air due to the nature of the valve. On a fully laden touring bicycle, this can mean that the tyres never get quite hard enough for road cycling. This may lead to considerable to energy loss throughout the day. 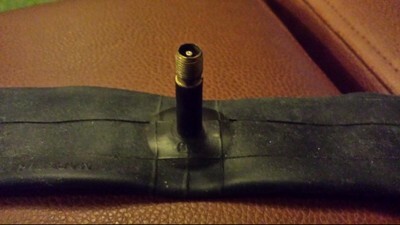 Inner tubes which have Schrader valves will leak air through them over time. The reason for this, is that if a cyclist rides across bumpy road, the valve will open up ever so slightly when it is at the top of the wheel rotation. Over a day on rough road, this can lead to a cyclist thinking that they have a flat. Even if they don't, they will need to pump the tyre up all the same. Although this type of inner tube might be readily available throughout the world, there is a minor problem. Its mass produced nature can lead to lower quality levels, requiring more frequent replacements. Which type of inner tube did I Choose to Use? Choosing between Presta and Schrader bicycle valve types, I picked Presta valves for the inner tubes for my next bicycle tour around the world. The main reason for this, came down to keeping the strength of the wheels rim with the smaller diameter hole. The longer valve stems also make inflating them easier. From experience, I know that the one main drawback to choosing Presta, is that sourcing new inner tubes may be nigh on impossible in certain parts of the world. Now, that said, it is extremely difficult to get any parts of a high quality in some parts of the world anyway. With that in mind, I may have to arrange several parcels of parts to be sent out to me when needed. Including a few inner tubes in the parcel is neither here nor there, and I always have a lot of patches to fix punctures during the mean time! Which type of bike valve do you think is most suitable for bicycle touring? Please leave your thoughts in the comments section below! This is the best discussion I’ve found on this topic -thanks for the dispassionate analysis. I’m planning a long bikepacking trip and am using my kid’s outgrown Schrader-equipped mountain bike and wondered is this a problem? (All the bikes I’ve owned since I was 15 have had Presta valves). Yes I’ve sheared off a Presta valve due to my own poor pumping technique, but I’ve also struggled to get a pump head to adequately depress the Schrader spring-loaded pin without the valve receding into the rim and fixed friends bikes whose under-inflated tubes shifted within the tire cutting through the Schrader valve on the sharp edge of the rim hole. There’s all kinds of incompetence out there, particularly my own. So thanks for being so even-handed and informative. I’m going for it with the existing Schrader Valves and if I die out there on the Palouse, I won’t be blaming you! I’m glad you found it useful! I’m sure you are going to be fine with your decision. Many happy tailwinds on your bikepacking trip! One big advantage of Schrader valves is the ability to be able to use flat proof. Whilst you can deliberately puncture a presta valve tube inject flat proof then repair it, it’s not ideal. You can also buy presta tubes with flat proof, but they are expensive. Having done a lot of riding in thorn country, flat proof works on almost all punctures except massive cuts. The difference in hole size between a presta and Schrader isn’t great. 6.5mm versus only 8.3mm needed for a Schrader, if you drill your own rim using a presta rim. I suspect the commercial drillings are larger to account for all valve stems. 1.8mm in a double wall rim is not a great deal of missing metal. Thank you for the clear description of both types of valves. We often take for granted the two valves without thinking of their pros and cons. Now I know why I had to add air to my tires at odd times on my trip across Canada. Carrying 3 spare inner tubes was the best spare item I had. These along with 2 spare tires were a life saver. It is amazing how quickly tires wear through to the canvas when you are carrying 65lb of weight.